The car has been spied and clicked on multiple locations during the phases of its development and Mercedes Benz is expected to officially reveal the car at the upcoming Geneva Motor Show 2009. The car looks great in profile with a combination of concave and convex rounded edges and sharp exterior lines. The fresh take on the E-Class’s styling is impressive. The front is dominated by a twin slat chromed grille with the famous three pointed star ’on’ it while the lower grille features mesh detailing with LED slits as fog lamps on both the sides. 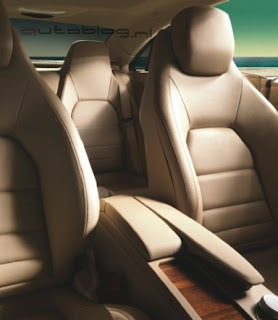 The interior features four seater setup which are covered in leather and will provide good lateral support while hard cornering. The trim is a combination of leather on a dash with sprinkling of wood and touches of aluminium on the steering wheel, gearknob and control buttons to complete the sporty yet elegant insides.